This cute little snake was only four or five inches long. We found it crossing the road at night when we were driving to our motel. 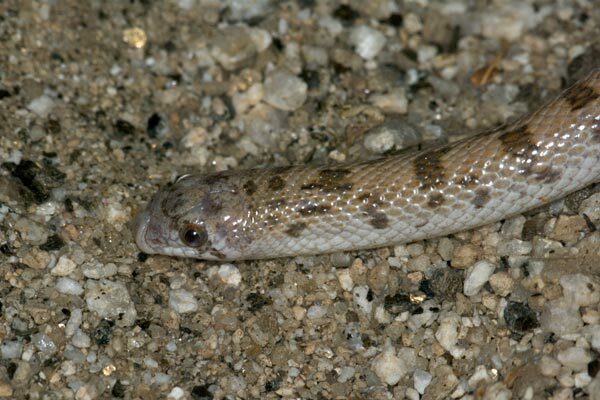 Leaf-nosed snakes have a large triangular scale on their snout, presumably to help them burrow. 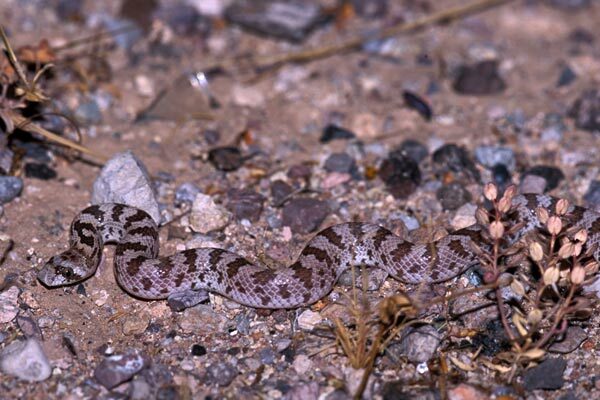 Before the days of road-cruising to find snakes, this species was considered quite rare. 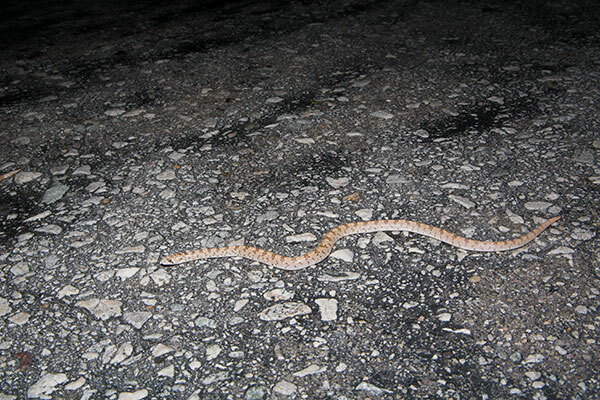 Now they are found often enough on roads at night to be considered one of the most abundant snake species in the area. At least until they find some better way to census the species that are not typically found on roads at night. 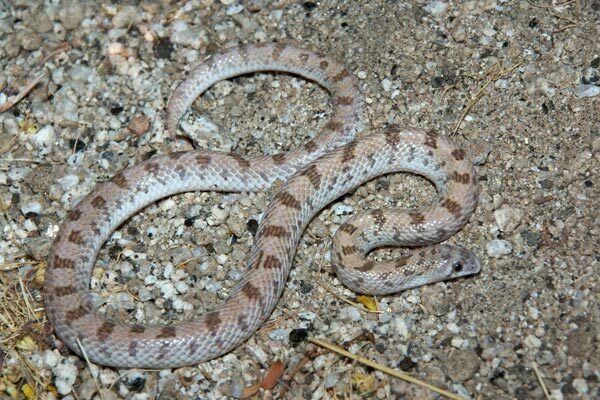 Until recently this individual would have been considered a member of the subspecies P. d. nubilis, or Clouded Leaf-nosed Snake. But the official North American names book has taken the no-subspecies stance on Phyllorhynchus decurtatus. Anza-Borrego Desert State Park gets very close to the Mexican border, and therefore the main north/south roads through it are very popular with white and green lawmen. Late one evening on one of these roads, I had pulled over for a shovel-nosed snake. While I was stopped on the shoulder, grabbing my camera equipment, a Border Patrol jeep slowed to a halt and a gentleman therein asked me "Are you OK?" (which I took as BP shorthand for "What the %#%@$ are you doing?!?"). I told him that I had seen a snake cross the road and wanted to photograph it, and he said "All right, as long as you're OK" and moved along, probably thinking I was a nutcase, but a harmless one. Fortunately he hadn't detained me long enough to prevent me from detaining the shovel-nosed snake briefly, and I got my pictures and moved on. A few minutes later I spotted the snake pictured here and pulled over. I was once again soon greeted by a high-riding vehicle with bright lights obscuring its occupants. A voice asked "What have you got there?" and I replied "Just a little snake I'm trying to photograph." "What kind of snake? We're herpers too!" came the response. They thought what I was doing was perfectly normal, of course. 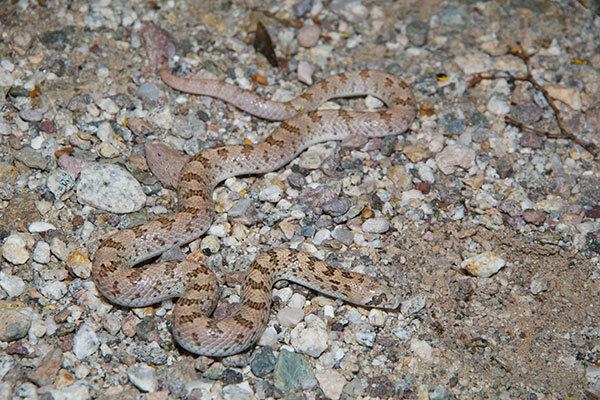 The little snake was not in a posing mood, and the two fellow herpers gave up trying to get photos after five minutes or so. I persisted at trying to calm the snake down and had reasonable success a short while later. When I spotted this little guy crossing a road at night, I got out to identify it and take a few pictures, but I didn't linger because I was on the prowl for rarer species. Obviously I didn't linger long enough, because I thought I was taking photos of a very young glossy snake, and I didn't realize that it was a leaf-nose until I looked through my pictures later. How embarrassing! 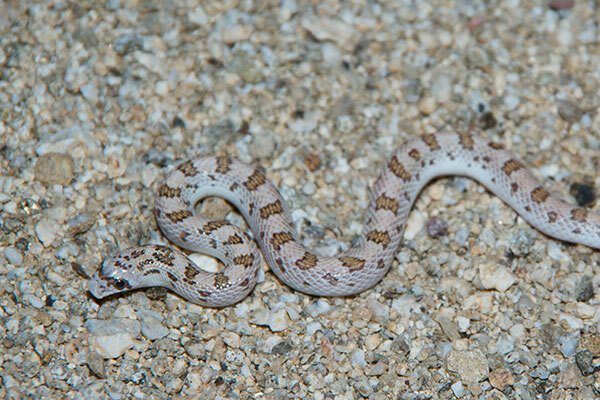 Another night out in the desert, another cute li'l snake that I initially assumed was a baby glossy snake but turned out to be a leaf-nose. Good thing I had only seen one glossy snake recently so I was still interested enough to make sure I didn't lose sight of it as it snuck across the road.